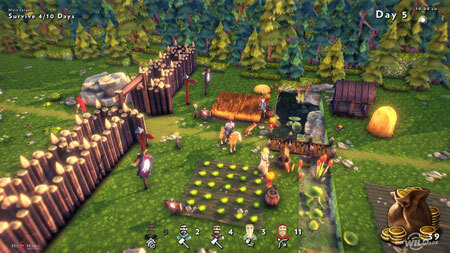 The Wild Age is a micromanagement strategy game developed by McMagic Productions, with tower defense gameplay mechanics. You will take on the role of the new ruler, who is tasked with creating a new, fully independent settlement on several islands. Meeting the goal is not always easy and you have plenty of options to develop your strategy. Every night enemy goblins attack your settlement, thus hindering your efforts. As a ruler, you can only give orders with coins. Your villagers carry out the tasks and their roles according to your decisions: repairing or constructing buildings, harvesting materials, hunting animals and guarding the walls. Completing main tasks in the main campaign will unlock special rewards for smoother passage throughout the game. There are several avatars and mounts available. Each avatar and mount has different attributes that will change your approach to the game. Several kinds of unlockable pets will follow and aid you throughout the campaign. To unlock some options, it is necessary to complete the main tasks of the campaign. If you get stuck in the game, check out the video walkthrough and gameplay for the game. This entry was posted in PC Games, Walkthrough and tagged The Wild Age Cheats, The Wild Age Gameplay, The Wild Age Guide, The Wild Age Strategy, The Wild Age Walkthrough by Marvin. Bookmark the permalink.